‘It’s taken me a while to write this blog for our first week back in Manchester as I think it’s taken me this long to settle! After performing the show “20 something” times at the Edinburgh Festival Fringe, I completely underestimated how it would feel to revisit the play after four weeks off and in a completely different space. We’re in “tech” on Tuesday after a line run on Monday evening. All ready for a dress rehearsal on Wednesday afternoon. ‘It’s good to be home, performing Cosmic Scallies in my hometown of Manchester. Edinburgh Festival Fringe is amazing but it’s kind of it’s own little world and it can consume you. I feel we have way more breathing space outside of our performances now. When you’re living literally inside of a Festival the show can follow you around everywhere. Here I feel I have more down time in between shows where I’m focusing on other things, living a regular life. This means I’m coming to work excited every day to perform the play, it actually allows you to miss the show and the characters. I feel Manchester is the perfect place for a play like this to be performed. The story is really resonating with the locals and the audience feedback has been fantastic. Skelmersdale is not too far from Manchester and the humour settles well. The various nicknames; ‘Dufflecoat Dave,’ ‘Scabby Annie’ etc and the past stories of school mischief and drunken nights behind the shops are familiar territory for audience members. The audiences in Edinburgh were very different but special in their own right. I feel like in Edinburgh we were allowing people into a world they’d never seen before. Whereas in Manchester we’re letting them into a place that they know and have possibly been a part of. That’s a generalisation of course, but I’d say that’s the main difference between the audiences. Cosmic Scallies, at Royal Exchange Theatre Manchester until Sat 14 October. It’s the third week of the Edinburgh Festival Fringe. It’s a pleasure to perform Jackie’s beautiful play every night, especially alongside Rachel. But this is only a couple of hours of our day. Walk to work, warm up and perform. What about the other 22 hours of the day? How do you survive the whole festival? At this point of the Fringe, if you ask pretty much any performer how they’re doing, they will most likely mention that they’re ready to go home. Not that they’re not enjoying themselves, but they feel they’ve had their fill of the place. This is regardless of how well their show is doing. Your number one priority is to put on as great a show as you possibly can, but don’t forget number two… Keep yourself sane. This is my fifth time performing at the Edinburgh Fringe so I consider myself a Seasoned Veteran (even if no one else does.) So I’ve compiled a Survival list for people performing for the whole month at the Festival. Pace yourself. The Fringe is the greatest place to watch a variety of shows. It can be really inspiring and thought provoking and you’ll often leave with loads of ideas for new shows to create. But don’t force yourself to watch plays if you’re not in the mood. The festival is long and there is loads of time. I’ve sometimes found myself feeling guilty when somebody has seen 100 shows to my 5 and then I’ve gone out to try and rectify this. But if you’re not in the mood this can sometimes effect the way you see a show. Have you ever watched a film and didn’t care for it, and then a few years later watched it again and realised you love it. You probably just weren’t in the right head-space to watch it the first time round. So pick your moments to see things, it’s not a race, it’s supposed to be fun. Network. The dreaded word. Networking. Now this is something I’ve never really loved to do, but ultimately it’s essential. It’s pivotal to put yourself out there a bit and form relationships with like-minded people who you could well work with in the future. Edinburgh provides the perfect platform to do this. It’s completely natural and not forced because you’re all in the same boat. You’re all doing shows so you all have things to talk about, you can watch each others shows, share ideas and inspire each other. And while you’re at it, make some pretty good mates. I have a tendency to want to leave the venue straight after my shows, it can get a bit intense and I like a bit of head space. But I think it’s important to try and stick around after your shows, even if just for a half an hour. Speaking with audience members can often be very touching and remind you of why you’re doing the show in the first place. Genuine positive feedback is never a bad thing and can often give you a much-needed boost to keep you going. And it’s just nice to give back too, as much as you might not think of yourself as special, sometimes you can make an audience members day by just having a little chat with them and listening to their thoughts. Get Away from the Fringe If you have a day off, I’d suggest escaping the madness of the Fringe. Edinburgh is a truly beautiful city with lots to explore. You can climb Arthur’s Seat and walk through the vast green of Holyrood Park. You can venture out to the seaside enjoying the beach and the rocks and Fish and Chips. Or perhaps just go to your local cinema. Whatever you choose just make sure you have some ‘normal’ time doing something away from theatre. It is literally impossible to live at the rapid pace of the Fringe without taking a break from it. Stay Healthy. The Edinburgh Fringe diet consists of beer, chips, haggis and more beer. And you should totally indulge in this. It’s bloody great. But not every day. You need to look after yourself, the last week is hard enough without your body breaking down. Being tired and sluggish will not be beneficial for your body or your performance. A hearty home-cooked meal now and again goes a long way. Lots of water too. You may feel invincible for a while but you don’t want to fall ill on the last week. As much as it feels like a holiday, you’re going to be there for almost a month, that’s a long time. Okay that’s the sensible bit done (ps I love haggis and beer). Think outside the box. In Edinburgh, you are likely to see the absolute best and worst of what Theatre has to offer, this is what my experience has been in the past. Picking shows spontaneously from being flyered and from what you like the look of in your brochure can have mixed results. Sometimes you will get lucky and end up watching a run of really great stuff. But sometimes it can seem like that brilliant show just won’t come, where everything seems to be a miss. Because of this it would be easy to think “Right, I’m not taking any more risks on shows I’ve never heard of. I’ll stick with shows from bigger companies and popular productions with critical acclaim.” I would highly advise against this. Some of the best things I’ve ever seen at the Fringe have come from smaller companies and artists who I’d never heard of, some of whom I’ll never hear of again. Often, some of the best shows get lost and unrecognised due to the sheer volume of productions there are. There is some incredible stuff out there playing to less than 30 people a night and their current Edinburgh run will probably be the last time they ever do it. There is something sad about that but it’s also quite a unique feeling to be one of very few people to have witnessed something so special. You might even be in a position where you can help these people, if you find some undiscovered talent it’s great to recommend these shows to directors and theatre companies you may know. The Edinburgh Fringe is a land of opportunity and we can help spreading the word of work we’ve seen and admire, just as others are doing for us. Of course the more well-known companies are also putting on some great stuff at the Fringe. Orphans by Dennis Kelly at the Traverse, a Paines Plough Production in 2009 remains one of the best things I’ve ever seen. So it’s all about the variety ultimately. Performing at the Edinburgh Fringe Festival can be a incredible experience and I hope this list can help to maximise your next or first ever trip! This week has been COSMIC Scallies first full week at the Fringe. We have had previews over the weekend and the feedback from audiences has been lovely. I have taken all of this on board and by the end of the week I am still exhausted! There is no other place like it; apparently the biggest selling event after the Olympics and the world cup, one taxi driver told me ! The variety and calibre of shows is incredible. I’ve had to plan my time wisely in order to see the shows I want to and really make the most of my time whilst I’m here. As well as all of this, we still have to make sure that we can perform our own show with the energy and focus that it deserves. Cosmic Scallies has had a great week – pretty much selling out each night with warm audiences that really add to the show. It’s strange coming into space just 30 mins before you are due on – getting into costume, warming up, getting the set up – all in that short amount of time. I have definately realised how much time I spend “faffing” when doing a show in the theatre without this time constraint! Amit (Director) and James (Assistant Director) both went home this week – as directors are allowed to do! So it has just been up to Reuben, Phil (Stage Manager) and I to try and keep the wheels on! That has been a little daunting but I think we have coped well. It’s such a delicate piece and does not allow either of us to have an “off moment”. It works the best when Reuben and I are fully connected. We are lucky in that we seem to be on the same page and can both sense when a moment isn’t quite working – and we are learning to nip these in the bud as soon as they arise. I need to go and do a show now ! Since being offered Assistant Director on Cosmic Scallies, my life has been a succession of new challenges, which have grown in scale and complexity. I’ve worked professionally in theatre for a little over two years, and this show marks the largest production I have been employed on by far. The wrestling and shaping of the script in rehearsals and the conjuring of a pair of complex characters have both been hard-won joys. The rehearsal room has demanded hard work from all of us, but the show that has emerged from it I am well proud of. In the transitions from Graeae’s rehearsal room to teching in the Royal Exchange, to performance at Northern Stage’s programme at Summerhall, my personal journey has been geographical as much as professional. On way up to Edinburgh last week, sat next to Reuben writing his own rehearsal blog, Stage Manager Phil drove us through the Lake District, into Scotland. As if that journey wasn’t beautiful enough, I’ve spent nine days in Edinburgh, between giant rocks and a castle. And the evenings I get to spend in a darkened room with 90-odd people, who’ve come to watch something I’ve helped make. I find it difficult to believe this is my job. 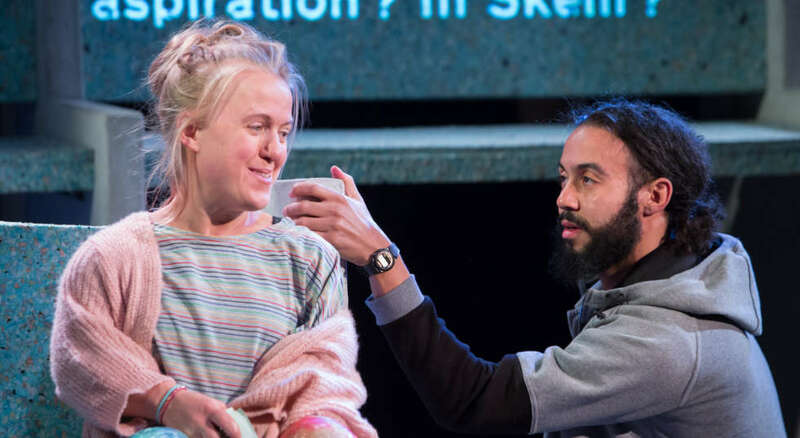 It is a testament to Graeae and the Royal Exchange the amount I have been involved in this production, that I have learned from this process, that I have been busy and challenged, but never overwhelmed. It’s a scary big world and doing new things in new places with new people is hard. Throughout this process I have experienced care, I have been supported and felt valued. And we’ve all taken the piss out of each other in good measure, too. I always think if you’re going to be working with anyone on any project, the whole process is made immeasurably easier (and the work far better) if you can be mates outside the rehearsal room too. I’m certain I’ll be seeing Reuben and Rachel for a pint when I’m back up next week. It’s my round. The week in Edinburgh comes hot on heels of the tech in Manchester. Aside from being all the things a tech can be expected to be, it was just excellent to finally see the cast and the set and the lighting and captioning and sound design all come together. It all became real in the space of about an hour. We had a show, a proper gorgeous show. And now that show is running up in Edinburgh and the past week I’ve spent there feels like a culmination of all the learning I’ve done to get here. This is no end point, though – the show’s future sits waiting for us to arrive. We have passed over a threshold. Cosmic Scallies is among us, its own living, breathing self, changing and growing each time I see it. I’m back in Edinburgh next week to see and note the show again. No doubt it will surprise me again. No doubt it’ll do that at the end of the month too, and when it comes back to Manchester in September. Cosmic Scallies is a show about helping each other out – there’s far more stumbling and obstacles in the path of Dent and Shaun but its always nice to make an analogy between the work you’ve made and the living you’ve done in the meantime. I’m as much proud of the work as I am grateful to the generosity and support I have experienced while making it. I hope to find and share as much in the rest of my career. I’m in a van off to the Edinburgh Festival Fringe for my sixth time, having previously performed there 4 times and visited the other. I love it there. The best and worst shows I’ve ever seen have been at the Edinburgh Fringe. But that’s what it’s all about. It’s a great chance to see smaller companies you’ve never heard of create some really inspiring stuff. Even when you see something you didn’t love, there might be a few things in that show that you liked, or that got you thinking, or that sparked some creative ideas. Plus most shows there are only an hour long so if something’s not your cup of tea, you can quickly recuperate and then off to the next one. It’s also good to see more established companies take new productions up with an added fringe element. A limited set and production value can really add to a show in my opinion. The feeling of watching a show in a little black box room still gives me the most excitement. And if all the play watching gets a bit intense you can head over to the Pleasance, watch some comedy and do some drinking. From my experience of the festival, I think Cosmic Scallies is going to fit in well there. Last week was tech-week at the Royal Exchange. The whole show is captioned which is a new experience for me. Every word of the play is projected onto the set. I think the captioning is really cool and it’s great how accessible the show is to everyone. It does put some added pressure on you to get all your lines right though. Those captions will catch you out. I’ve enjoyed working on the set for the first time, it’s a bit quirky and a bit wonky which is spot on for Skem. It’s not very big so we have to help create the world with our physicality. We’ve done work with Amit (Director) and Chi-San (Movement Director) to help differentiate the locations. We came a long way last week. I won’t say we were behind at the start of the week, but I will say there was a lot of work to be done. After a slow start on Tuesday we got back on track for the rest of the week. We had struggled previously with the last third of the play in rehearsals, which is always a tough part of any production to get right. It’s where you get to grips with what the characters really want and what the play is all about. And sometimes them questions are tough ones, especially when you have such a complex play with diverse characters, and you somehow have to wrap the play up in a truthful yet satisfying way. But something seemed to click this week with the end section of the play. Jackie made some positive changes to the script and Amit’s always full of interesting ideas to help tell the story more effectively. At this point, Rachel and I feel we know our characters inside out, so we’re always trying new things when performing too. It’s funny actually, the last scene was the one we dreaded the most at the start of the week, and by the end of the week Rachel and I agreed it was the scene we most look forward too now. We finished the week with 2 dress rehearsals and 2 previews. It’s a really fun play to perform and I think we’re finding more and more things each time. I adore the characters and we’re ready for our first show now! Edinburgh we’re coming for you! In that case Amit, I’m gunna make it rhyme. The audio description, he needs to prep. But I still seem to forget where to go. Why do they say this? What’s their goal? But we still find the time for an after work drink. I don’t really know what “dynamic” means. You form bonds pretty quickly in theatre, it’s really the only way. So at the start of the second week the banter had commenced. A pair of sandals sported by our Assistant Director James being one of the early talking points. As a team we’re now pretty comfortable with each other and we’re all vocal in our input as we discuss our thoughts and ideas about Cosmic Scallies. And with a two-hander play you have to be. With a cast of 20 there might be a few days where you can drift into the background, with a smaller company you need every brain engaged at all times. This week was all about getting each scene ‘up on its feet,’ continuing on from last week’s work which was more table-based. Amit (Director) poses the following questions to myself and Rachel “What is your character trying to achieve?” and “Why are they saying this now, at this particular moment?” Amit wants us to constantly ask ourselves these questions for each section of the play. Sometimes it’s difficult to answer. Jackie’s writing really comes off the page well and so immediately you think you know what’s going on, but once you start to explore further you realise there’s much more to what we’re saying. The back and forth between Shaun and Dent in the script is electric, but if it becomes just about having digs at each other then we lose the colour of the play. “What does Shaun actually want at the end of this exchange?” We’re starting to find that extra bit of detail and the characters are becoming more three-dimensional as we hit mid-week. Rachel and I filmed a video diary towards the end of the week where we chatted about Cosmic Scallies and it’s themes. I definitely waffled on a bit but I think we did okay. I’m way more comfortable acting on camera than just being myself on it, I’m not sure what that says about me. With this being a brand new play the script is ever changing. There are various incarnations of the script to be found all around the rehearsal room. Just as we are challenging ourselves as performers, Jackie is challenging herself as a writer. So as we work on the play and discuss it, Jackie has been taking everything on board and going away making improvement’s to an already solid script. This does require patience from us actors but it goes with the territory of new writing. And to be honest it’s been pretty exciting to read the new material each day, some of which I can’t get through without the giggles on a first read. There’s so many killer one-liners in this play. Culminating everything we’d worked on this week, which also included some physical work with Chi and accent-work with Elspeth, we did a stagger through of the whole play on Friday. Putting the scenes together you really sensed a robust, dynamic energy that the play brings. It’s fun, it’s fast and it hits hard. I think as the run went on, Rachel and I got more confident and started to really enjoy ourselves. We started to relish Shaun and Dent’s up and down relationship more as well as their ‘wonky personalities.’ I’m looking forward to starting week 3 tomorrow and I should probably go to bed now as it’s getting late. I love first days of rehearsals. I always “treat” myself to something new for each new job….this time it’s a new water bottle. We have a very modest call time of 1.30pm. At 1.30pm the whole company comes together for the “meet and greet”, it is always a lovely way for everyone to ‘meet and greet’ for the first time, although it is very rare that I will remember all the names. COSMIC SCALLIES is a co-pro with Graeae Theatre Company and the Royal Exchange Theatre, for Northern Stage’s programme at Summerhall this year. So that’s a lot of people to meet! After the meet and greet, we have the first read-through. Everyone has read the play and knows it, but it’s always good to get to listen to it for the first time – to see what’s landing and what isn’t and for us just to get it off the page. Next is the model box presentation, this is one of my favourite bits of every first day, for me it’s a time when it becomes real. Bethany, the designer presents us the model box, which is basically a model of the set. It’s great to see the design and to see what we will have on stage, practically. Bethany also shows us some stimulus that she has used for her design; photos of Skelmersdale, places that are mentioned in the text and other images which have inspired the design. That’s pretty much the end of a successful day 1! Today we have writer Jackie Hagan with us. So Amit starts the day with another read-through of the whole play, to allow the writer to hear it with the actors voices and for Reuben and I to have another chance to give it a read. For this readthrough, Amit suggests that we place ourselves in the space and this seems to free us up a bit. 1. What is the play about? 2. What does our character want? 3. And what does our character want from the other? These ‘simple’ questions are not as easy as they may sound, but we eventually amalgamate our answers, which will keep for reference for if we lose our way during the process. After a cup of tea and a quick warm up we begin day three. We begin with continuing to unite the text, which is basically splitting the scenes into sections of thought and/or action. We talk about each unit in detail focussing on what we want from the other character? Why are we saying these things? And why now? We also use this time to explore potential cuts and changes – using previous drafts and new drafts. At some point we have about 4 drafts in front of us! It may sound overwhelming, but to have the actors, director and the writer in the same room is a great opportunity to get the perfect story out there. Reuben and I end the day with Elspeth, the dialect coach. Reuben is originally from Salford and I, from Essex so for us to get a true representation of the Skelmersdale sound – we need a little guidance to make it as accurate as possible. Today is spent continuing to unit – this is always a lengthy process but one that is totally worth it in the long run! The more detail we go into at this stage, the clearer it will be once we get it onto its feet. We bring the first week to a close with a movement session. For me personally, being a disabled actor – playing the part of a disabled character is an interesting relationship. Because yes, my character has the same condition as me (achondroplasia) but it’s her experience with this condition that makes her. My character is in a lot of pain, and this pain may be similar to mine but in developing my role I need to consider her environment, her diet, her lifestyle and the support that she has, which will all contribute to her pain and the relationship that she has with this pain. We spend the morning exploring our character’s physicality’s through many exercises and improvisations – which allows us to tap into them in ways that we haven’t yet tried. Sat 5 – Sat 26 August 2017 (except Wednesdays) | 18:30 (70 mins approx).